Three weeks from now, at this time, I will be in line bright and early at the Boston Comic Con. The Boston show has just grown exponentially over the last few years. The guest list keeps getting bigger and better. And now panel discussions and other events will be happening too. I have been able to grab some great commissions at the show in the past. But more importantly, I have met a lot of my favorite creators. As I usually do, I figured I would review the commissions I am hoping to get. Obtaining commissions is one of the best parts of going to shows like this. While there are many many many artists I would love to get a piece from, here are my main targets. Francis Manapul - I have been a fan of Manapul's for a while now. His work was one of the few things right with the most recent Jim Shooter run on Legion of Super-Heroes. I thought his style fit the Superboy run on Adventure a couple of years ago. And now he is reinventing the Barry Allen Flash. Kevin Maguire - What isn't there to love about Maguire's art. He is one of those creators whose work I will always buy. His most recent work has been the Tanga strip in Weird Worlds and My Greatest Adventure, and that strip was a romp. But I also loved his work on Batman Confidential, Justice League, the Metal Men feature in Doom Patrol, etc. He also will be doing half the art on World's Finest. A friend of mine came within a whisker of getting me a Maguire commission at the NYCC a couple of years ago. I hope to get one on my own now. Ed McGuinness - I put his name down as a 'wish list' name. I love McGuinness big bold style. I love how he draws Supergirl. 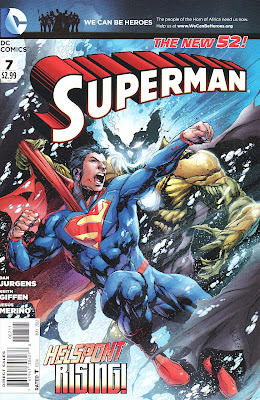 And this cover on Adventures of Superman during the Emperor Joker arc is one of my favorite covers period. I don't know if he does commissions. I doubt I could afford one if he did them. And he will probably be swamped with fans. So I highly doubt this one will happen. And it's a bummer because I said that if I had the chance I would do anything for a McGuinness commission. Chrissie Zullo - I love Zullo's style. 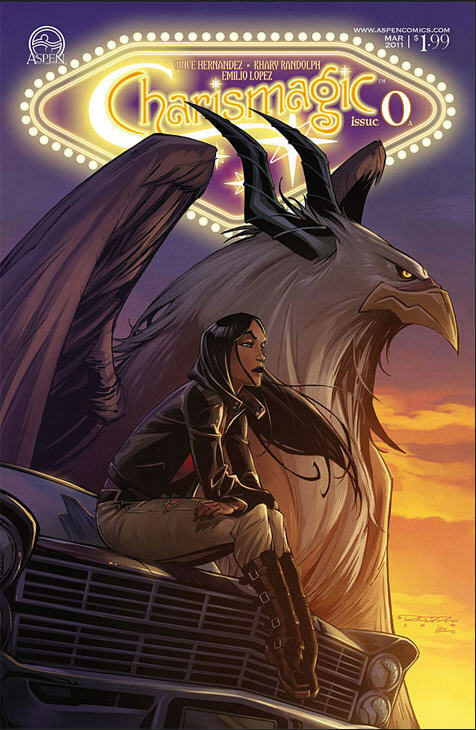 She is most famous for the eye-popping covers on the Fables Cinderella spin-off mini-series. Getting a commission from her would make my day. Jason Pearson - Pearson has become something more of a cover artist and will probably be buried by the Deadpool fans in attendance. But I loved his work on the 5YL Legion and the other DC work he has done. Will I be able to get on his list? I can only hope. Khary Randolph - I don't usually get Aspen Comic titles but I heard some people talking about Charismagic in my comic store and bought some issues on a whim. It is a great little comic with great interior art by Randolph. I hope I'll be able to land something from him. Now I get my commissions in sketch books. I have 2 books which I sort of rotate around. So there is no way I can end up with all of these. I strive for 4 commissions per convention, hoping I can get each book in the hands of 2 artists over the 2 days. So we'll see. I also have a nifty idea to help support some of the local artists in Artist Alley. But I'll talk more about that if it comes to fruition. Now there are many many other guests there who I hope to meet, chat with and get some signatures from. Old friend Jamal Igle will be there and I hope to talk to him some more. If anyone is going to be at the con, I'll be the guy in the Red Sox hat and Supergirl t-shirt. If you see me, say hi! We are only half a year into the DCnU and already Superman has a new creative team. In some ways I would think that was a sign of instability. In other ways, I might wonder why DC would green-light the Perez run if they knew he would only be around for one arc. This was supposed to be a jump-on point and switching directions and creators so quickly seems off. That said, I was pretty underwhelmed by the George Perez story arc. It certainly was stuffed with story, being one of the denser books that I have read recently. But it seemed to concentrate on the wrong aspects of the story. And that ending ... well, I talked about it enough in my review. So in comes comic veterans Keith Giffen and Dan Jurgens to guide the Superman ship moving forward. I am a Giffen fan since the Legion days and more recently the Doom Patrol. And Jurgens was the captain back in the 90s. Would they be able to recapture some of the magic of the Man of Steel? Well, I have to say 'so far so good'. There were some things that worked very well in this issue. And there were other parts that didn't sparkle quite as much. But overall, this was a good read. The opening page sort of set the table. 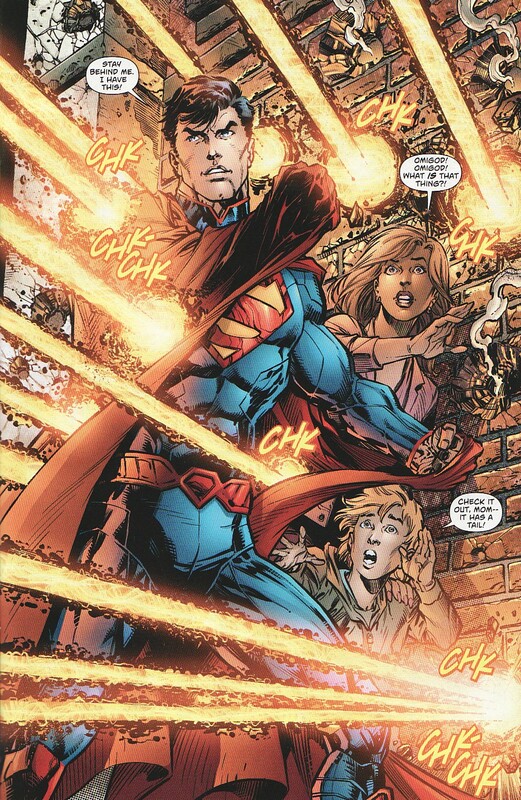 This is such an iconic type pose for Superman, shielding people from harm while lasers bounce off him. I even liked the grasping of the cape, adding some surface area to his protection. I am a Superman fan. That means I like seeing Superman be Superman. And this counts. Some sort of tech/robot minotaur-like unit is blasting through the city. And as the battle unfolds, we get some insight into Superman himself ... some much needed characterization. 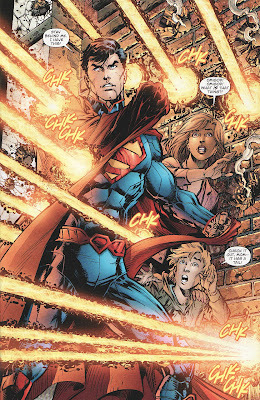 Superman says this is a 'call out', an encounter where someone starts tearing up the city to get Superman's attention. He hates them and almost wishes he could set up schedule. Annoyance at these bothersome brawls makes sense. But this is a construct after all which means Superman can unload on it. It is a quick fight once Superman knows this isn't a living thing. So we know this is someone who cares about the sanctity of life, even his enemies. Now part of the problem with the last arc (and even Grounded) is the overwhelming sense that people don't like or trust Superman. Once the battle is over, we get to hear the reaction of the crowd. Some are still worried or hateful. But others are cheering and adoring. I am sure if Superman was really around there would be people on both sides. But at least now we get to see some supporters. The minotaur-unit is hauled away to S.T.A.R. labs. And we learn that it was a drone of sorts sent by the Daemonite Helspont. 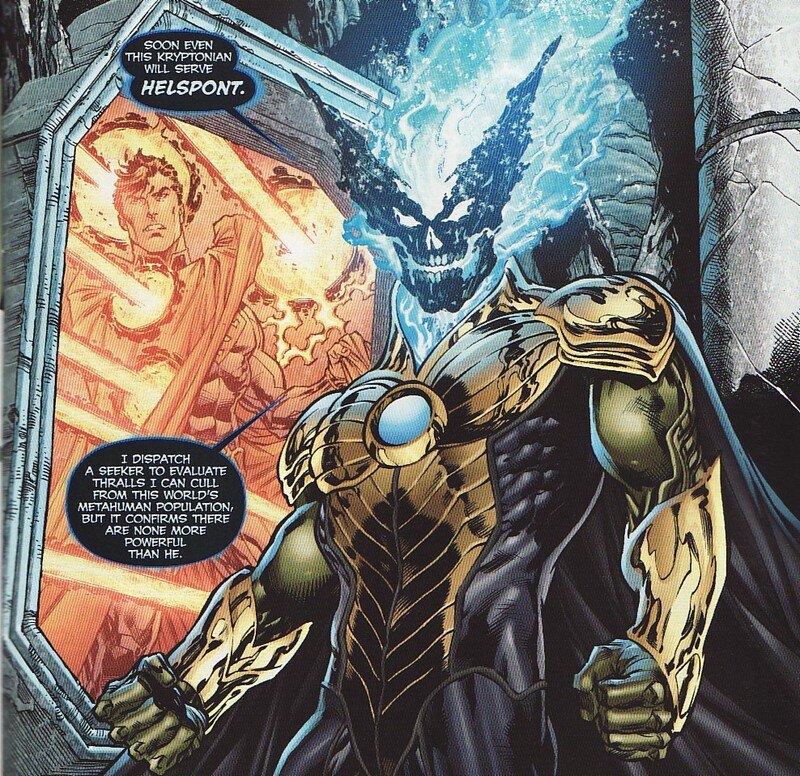 Helspont realizes that if Superman becomes his agent, he will be able to take over Earth. Now I don't know anything about Daemonites or Helspont. So that makes it tough for me as a reader. Does he have the power to enthrall? Is he just a despot? Is he an alien? I suppose I will learn more soon enough. He does look really cool though! 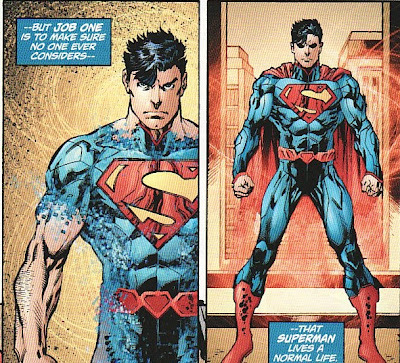 One thing I really liked about this issue was the handling of Superman in his Clark identity. He is bombarded with requests by his friends. Jimmy needs a place to stay while his apartment is being fumigated. Lois needs someone to pick up Lucy form the bus station. And Perry wants him to rewrite his articles to play up the Superman angle. Somehow in the cacophony, Clark mistakenly agrees to it all. I love the sort of dumbfounded 'what just happened'. It makes Superman more human. He can pound alien robots but can be overrun by friends. 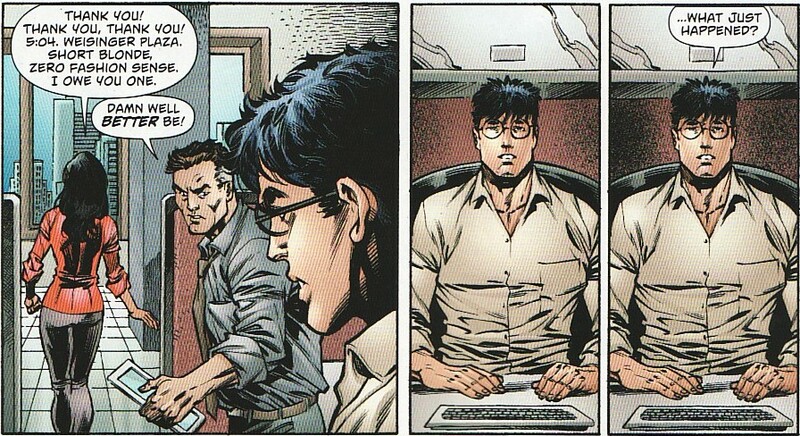 I also like how Clark struggles writing articles about Superman, the ultimate in conflict of interest. He is already humble. It must be tough to pump his own tires. 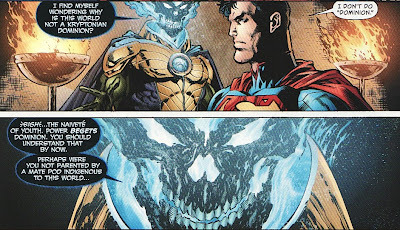 In an variation of the 'calling out', Helspont sends his drone to the Daily Planet to attack Superman while he is Clark. In a nice nod to the past, Clark runs into an empty conference room to change into Superman. (I would have preferred a supply closet.) Here we learn that the bio-suit he donned on the Collector's ship must be made of unstable molecules. The Clark clothes seem to morph into the Superman suit. I could never easily explain where the cape and boots were when he was in Clark-mode. So this explains that. I think I will need to think about this more before I give it a full seal of approval. 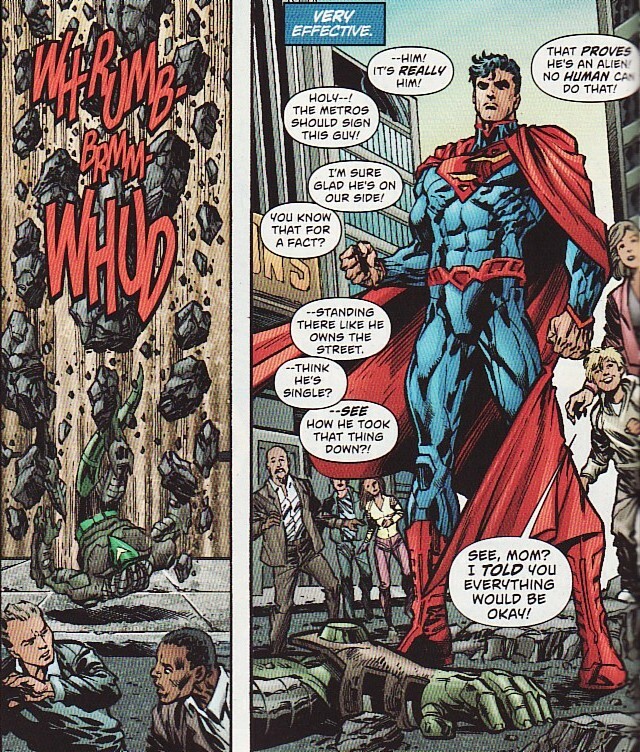 The bigger thing here is that Superman says that no one knows that Superman leads a normal life. No one wonders what his secret identity is because no one thinks he has one. I like that. It harkens back to Byrne's run. This fight with the unit is even shorter as it teleports Superman to the Helspont's headquarters. An interestingly calm conversation ensues. There is a bit too much monologuing here as Superman permits the Helspont to talk for some time. Earth has been looked over by the other Daemonites. Helspont wants to rule it. He is surprised how many beings on Earth are near godhood (as we see Wonder Woman, Flash, and Green Lantern). And he wonders why Superman doesn't rule. 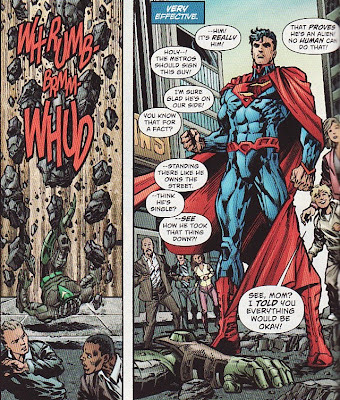 I like that Superman says he 'doesn't do Dominion'. 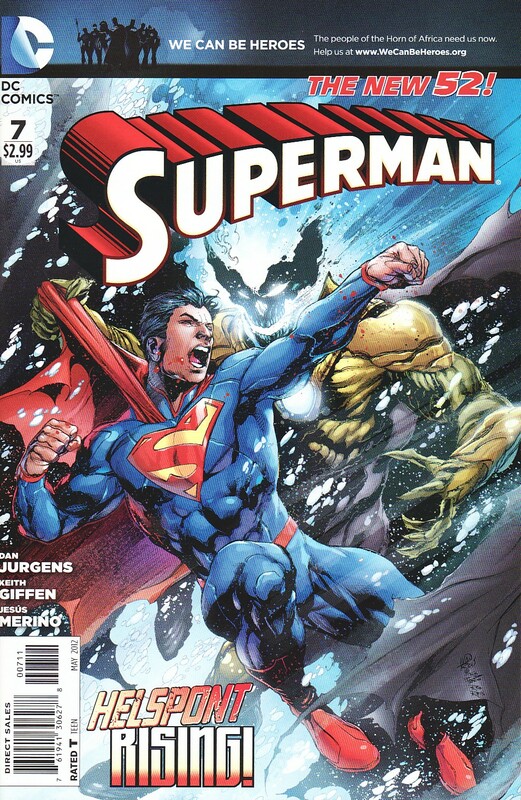 There is also a sense that Superman is almost humoring Helspont by letting him prattle on. But after a while, Superman has had enough. It did feel like Helspont went on just a bit too long here. Again, since I know nothing of Helspont, I don't know how much I should be understanding the things he is saying. Superman says it is nonsense. I have to agree. With one blast, Helspont defeats Superman. At least I get a hint that Helspont will fill me in soon. I don't need to know everything right away as a reader, just enough to know motivations. But there is more consequences here than just an alien tyrant trying to take over. Lucy is left at the bus stop! I had to include this if only to show that Lucy is in the DCnU. Will she be as interesting here as when she was Superwoman? So, overall, this felt like a Superman comic. Since the end of New Krypton through Grounded and into Perez; arc, all I said I wanted was Superman to be Superman, defending Metropolis, being a beloved hero, and interacting with the Metropolis gang. This issue had all that! Hurrah. It has only been a couple of years! Now I have some reservations about the Daemonite plot, especially if Superman gets controlled and acts the part of the bad guy next issue. I wish there was some background to Helspont provided as that might make this an easier arc to grab me from the beginning. Jesus Merino continues to provide great finished art here. My suspicion is the World Killer project was begun in Argo City on an intact Krypton. I doubt that the citizens of a displaced Argo would be interested in capturing embryos from other planets. They would probably be looking for a new world to inhabit. So let's start here. But more importantly, the 5th World Killer tube is shown to be empty here. So the fifth World Killer wasn't gestating with the rest of the brood. So at some point, that World Killer was added. It adds some fuel to the Supergirl being Number 5. 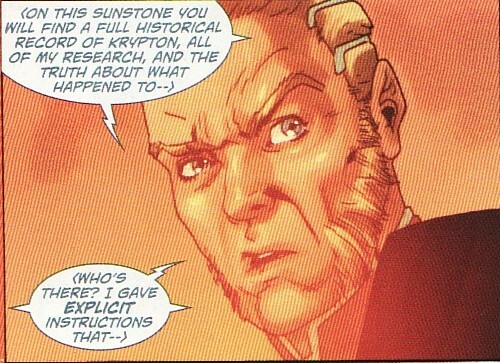 At some point after this, Jor-El figures out that Krypton is going to explode and tells his brother. 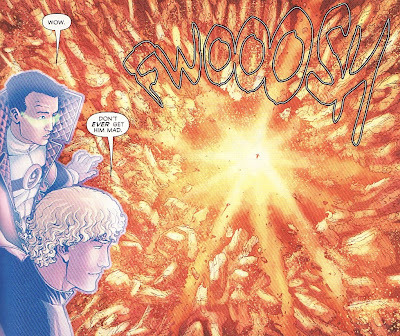 Zor-El decides he has to come up with some way of saving the city and comes up with the idea to use a force field. Now I am wondering if the force field ability is linked to the World Killers somehow. Maybe an innate ability in one of them that Zor exploited while they were in stasis. It would explain how NYC was encased. And why he 'designed' a force field but as machines that will provide atmosphere. Obviously this is before Krypton exploded. 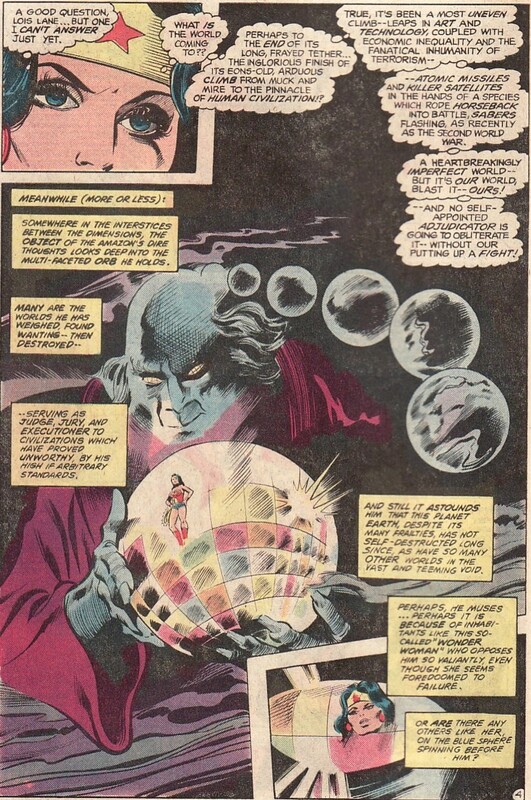 Here Zor-El talks about Kara being put in a protective pod and sleeping through Krypton's destruction. 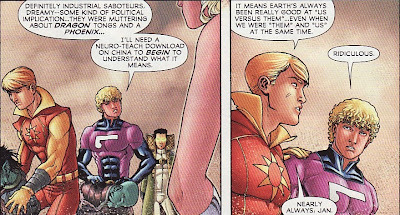 So this would explain why Kara has no recollection of the destruction of the planet or knowledge of Argo's fate. Given the context of the other stuff, Zor talking about his research sort of cements my belief that he worked on the World Killer project. But what does he need to tell Kara the truth about? What happened to ... what? Alura? Argo? The World Killers? Unfortunately, Zor gets killed before he can let us know what he meant. He clearly recognizes the person who blasts him. Who would kill him? And why? Maybe he objected to what the World Killer project was all about and someone offed him before he could blow the whistle? Someone with a vendetta against the Els? But remember, this was taped before Krypton exploded. So Zor didn't live long enough to see Argo survive. My guess is that Kara is already slumbering in the pod when he records this. But what if a distraught Alura, figuring she and Kara were the next targets, decided that the best way to save Kara was to make her stronger, subject her to the World Killer tech and hide her in the fifth tube? 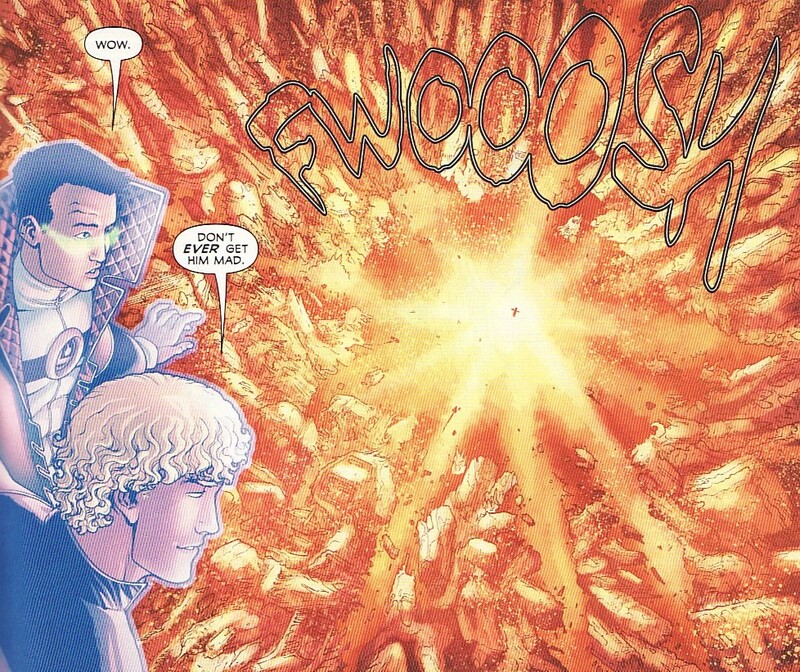 Regardless, Kara is somewhere (pod or tube) when Krypton explodes. And someone is around to watch over Kara during the disaster. 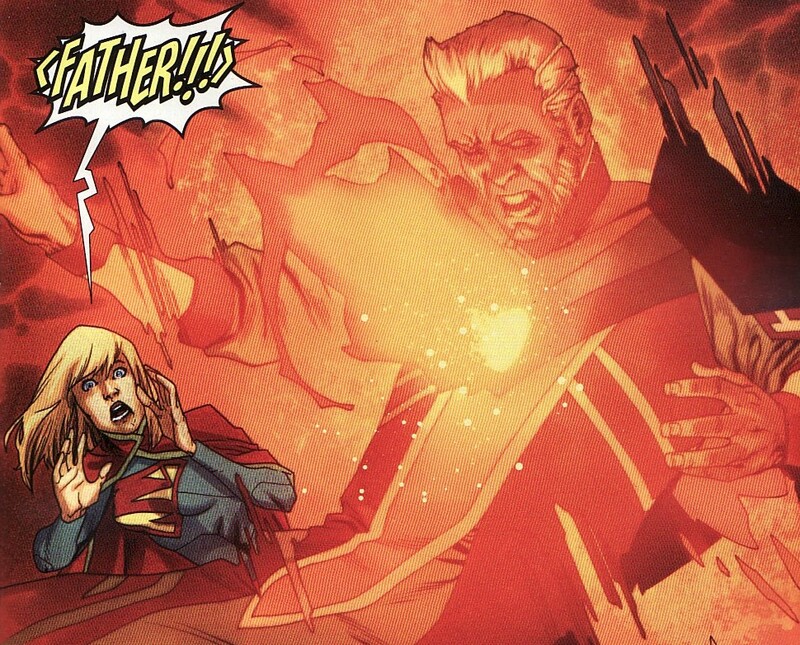 My assumption is it's Alura, even while she mourns Zor. Argo initially survives, drifting in space, until the force field for some reason dissipates. Is this because the World Killers were awakening? And as a result, the control over their abilities began to weaken. If the city is dying, whoever is caring for Kara would want to save her any way possible. That someone somehow sets up the stargates that lead to Earth. Someone had to put them there. And that had to happen when Argo got trapped in the blue sun's gravity well ... so, recently. It would makes sense for that person to be Alura. She would know of Earth from Jor. She (at least prior incarnations of her) would know the science to create things. And who else would care enough to set up a star gate connecting to Earth. At which point, the pod is fired. Given that the pod shouldn't be fired before the gates get put up, it makes me doubt this was an automatic launch. Someone launched the pod. Could it be Alura? That would mean she would have been alive recently? And did someone tinker with Supergirl's genes before putting her in the pod. I still doubt that she is the World Killer. Anyways, my guess is we will continue to learn more and I will continue to amend my guesses. Anyone out there with theories? 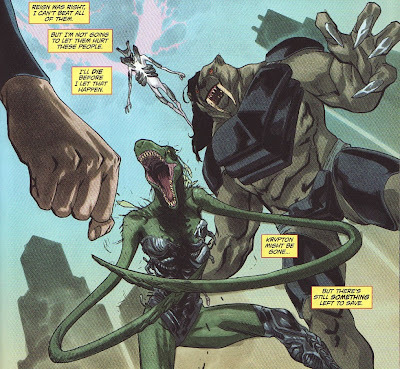 In Supergirl #7, Supergirl battled the Worldkillers, a group of beings which reminded me of the Four Horsemen of the Apocalypse. And that reminded me of the time Supergirl really fought a member of the Horsemen, back in Wonder Woman #292 from way back in June 1982. This issue was the middle chapter of a three part story written by Paul Levitz and drawn by Gene Colan. 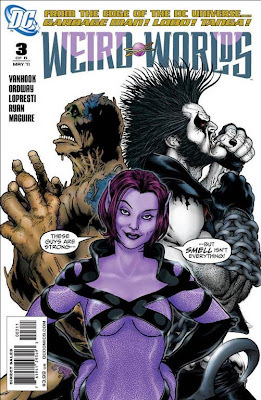 Back then, it stood out on the comic spinner rack because of its cover design, looking more like a 'real' book'. And it was something of a novelty back then as it was a 'female-only' crossover. 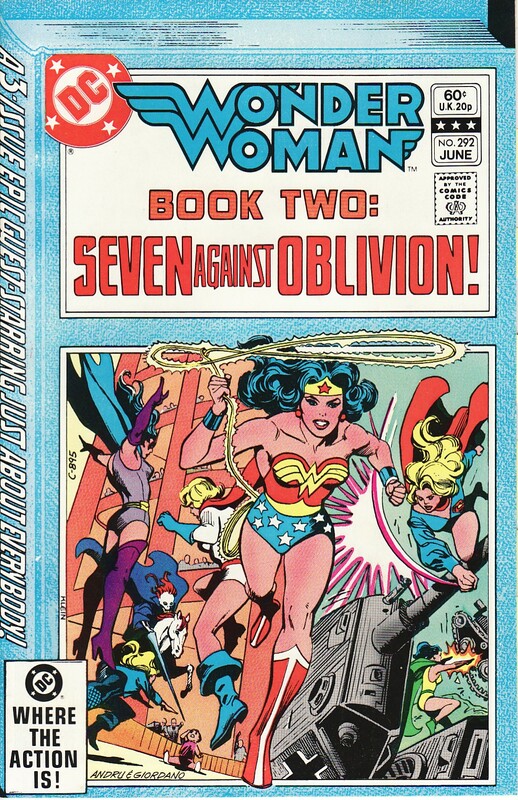 Levitz crafted a story with a big scale as Wonder Woman battles a major power threatening the entire world. And with a threat that big, she needs a little help from her friends. 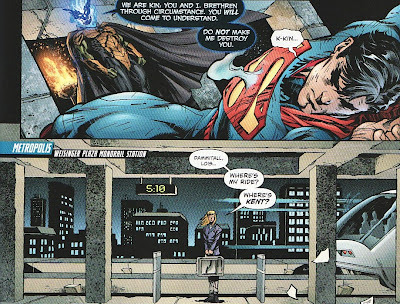 What is interesting is the semi-prickly personality that Levitz gives Supergirl here, a characterization that stands out even more given how he portrayed her over in the Legion. As for the art, Colan did his usual ethereal and solid work here. In the last issue, an seemingly omnipotent being named The Adjudicator lands on Earth with the intent of passing judgment. 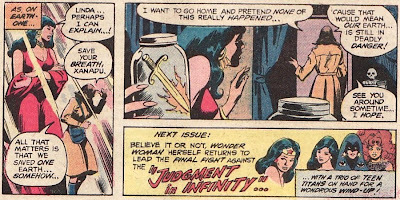 Wonder Woman is able to see visions of The Adjudicator finding other worlds lacking and wiping them from face of creation. What's worse is that no planet seems to have found to pass muster. He has found each and every world wanting. But Earth and Wonder Woman intrigue him. 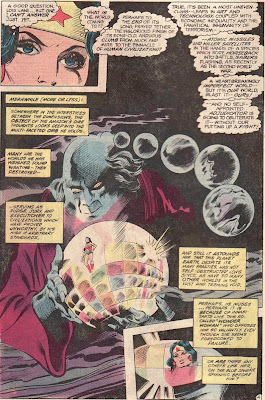 He is able to sense the many Earths in the multiverse (this was pre-Crisis after all). And the variations on the planets fascinate him. He wonders if some version of Earth will be found worthy. Could it be because of heroes like Wonder Woman? To challenge these heroes, The Adjudicator creates The Four Horsemen, imbued with powers based on their aspect of the apocalypse, and sends them to various Earths. 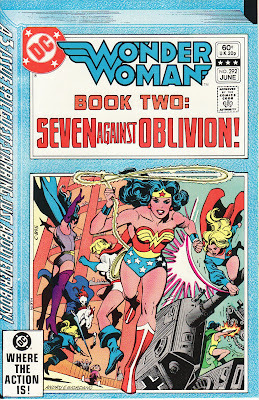 And Wonder Woman mobilizes her teams and sends them out to defend the world. Supergirl is sent to Greenwich Village to team up with Madame Xanadu. Supergirl seems almost irritated at being asked to do this wondering why she is 'running errands for the Amazon anyway!' Seems a bit off for Supergirl. This Supergirl has never met Xanadu and Wonder Woman didn't fill her in either. 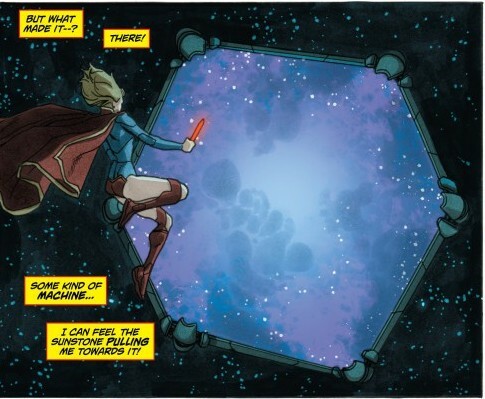 So, in her Linda Danvers identity, Supergirl is shocked by the doors opening on their own and Xanadu's apparent knowledge of her Kryptonian heritage. The Adjudicator has been watching this whole interaction and decides to speed things along. 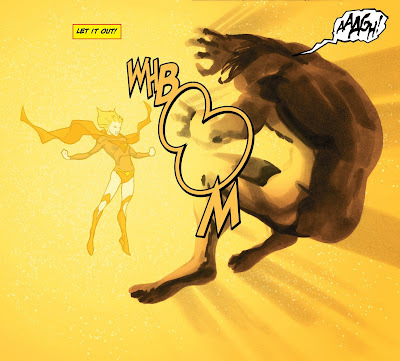 He sends Supergirl and Xanadu to Earth X. 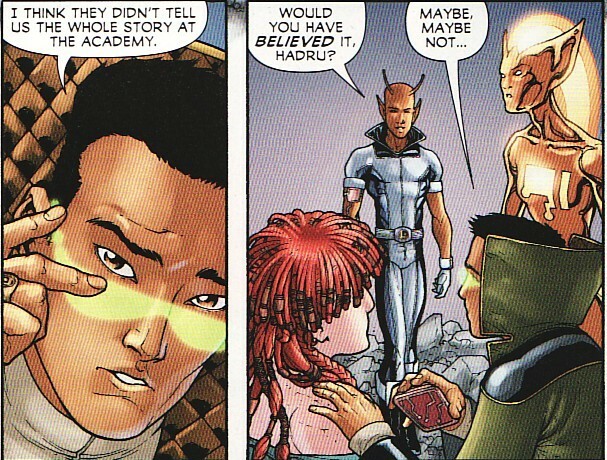 For those not in the know, Earth X was the home of the Freedom Fighters, a world where Germany won World War 2. And what better place to send the Horseman War. Tanks are constantly rumbling, soldiers are always on the march, and rebel factions are waiting to strike. And there is War, riding on his red horse, swinging his flaming sword, and fueling the fires of conflict. It's great to see Supergirl so ready to jump in and engage. If it's a fight war wants, it's a fight he'll get. 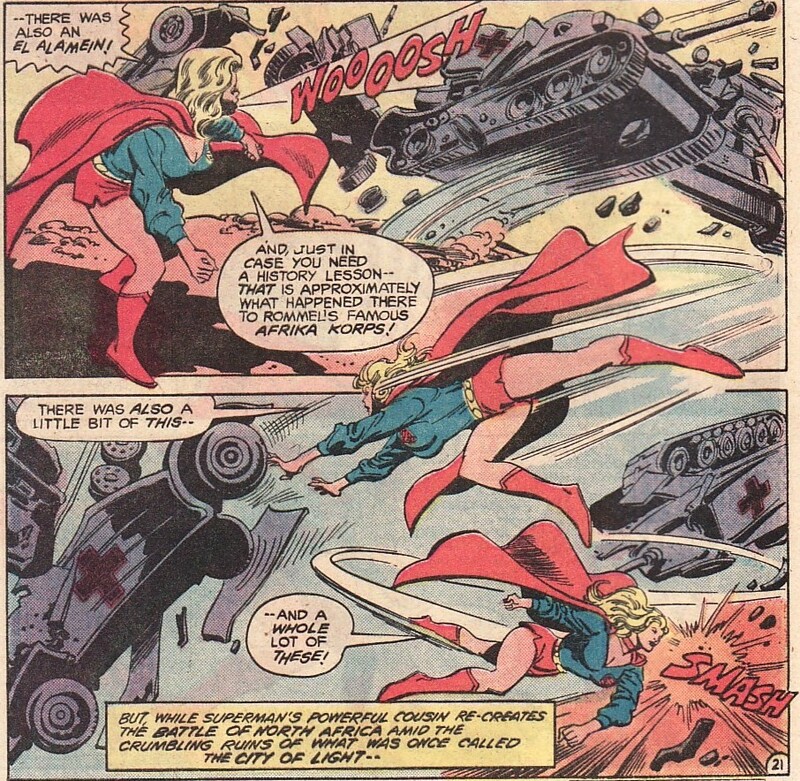 Seriously, how awesome is it to see Supergirl smashing Nazi Panzer tanks? And to bring a little history lesson to it as well! It's the battle of El Alamein all over again! But War doesn't take sides. War simply wants fighting. 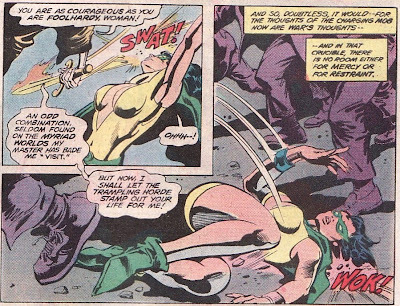 He is able to enrage the French rebels into a berserker frenzy such that they lash out at friends, even Phantom Lady of the Freedom Fighters. 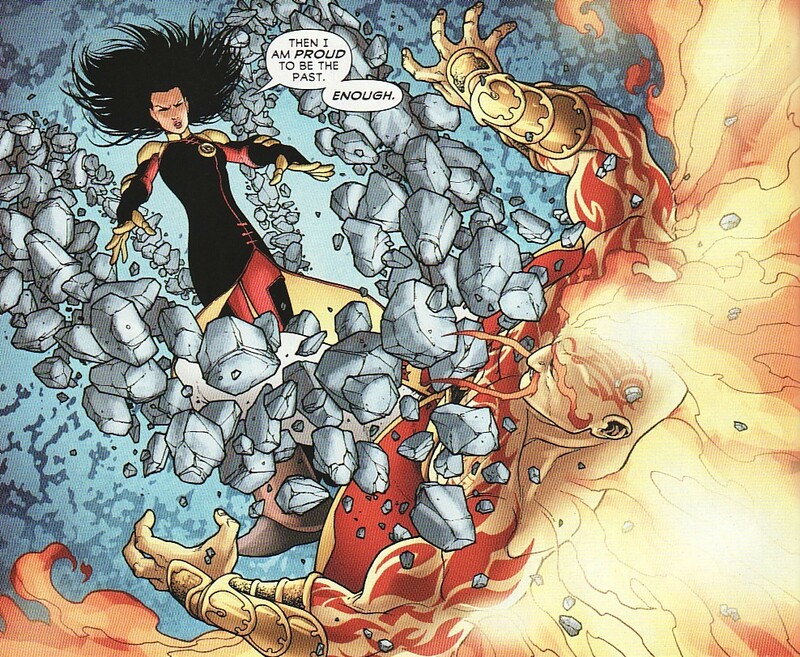 While Supergirl continues to bash away at the war machines, Madame Xanadu takes the battle to War itself. She shows him the tarot card of the Fool and when faced with the fact that War is a Fool's errand, the Horseman is frozen in his tracks. And this defeat angers the Adjudicator. The Adjudicator dissipates his creation and sends Supergirl and Madame Xanadu back to their Earth victorious. This is something of an understated win for the heroes but it is a win nontheless. The issue ends on something of a sour note. Supergirl storms out of Xanadu's store ... unwilling to hear an explanation about what happened and hoping to forget the whole thing. That seems somewhat out of character for that version of Supergirl. You would think Kara would want to know if the Earth is still in peril. This is Wonder Woman's story after all, Supergirl a bit character in this arc. I suppose nuance isn't what was needed here. It is Diana who ends up saving the world. 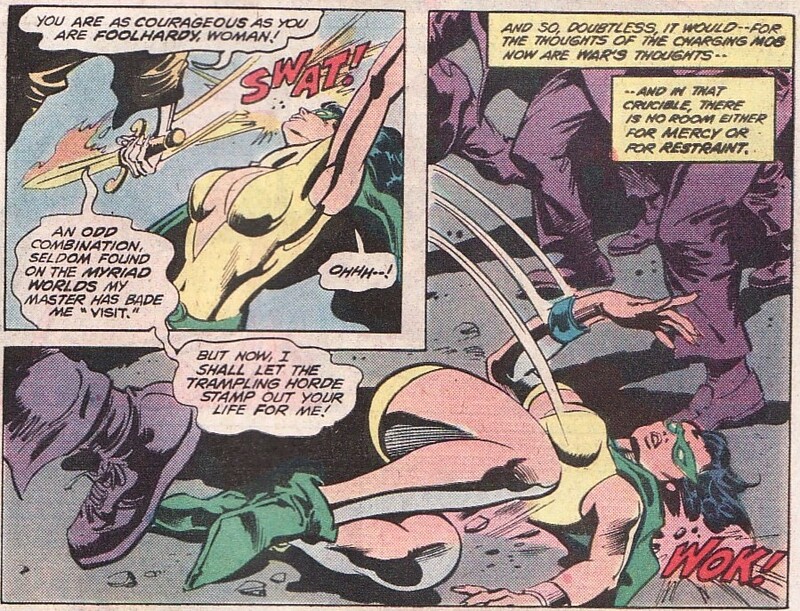 She combats the Adjudicator both physically and psychologically while the other women heroes are imprisoned. 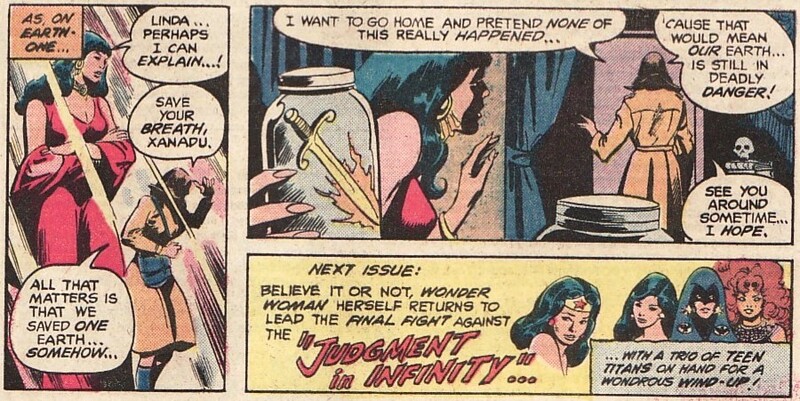 In the end Wonder Woman defeats the Adjudicator by making him face his own insanity. 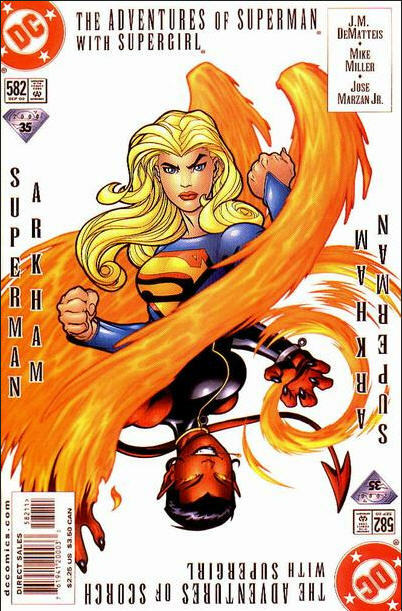 For a Supergirl collection, this issue (and this story) are of minor importance. 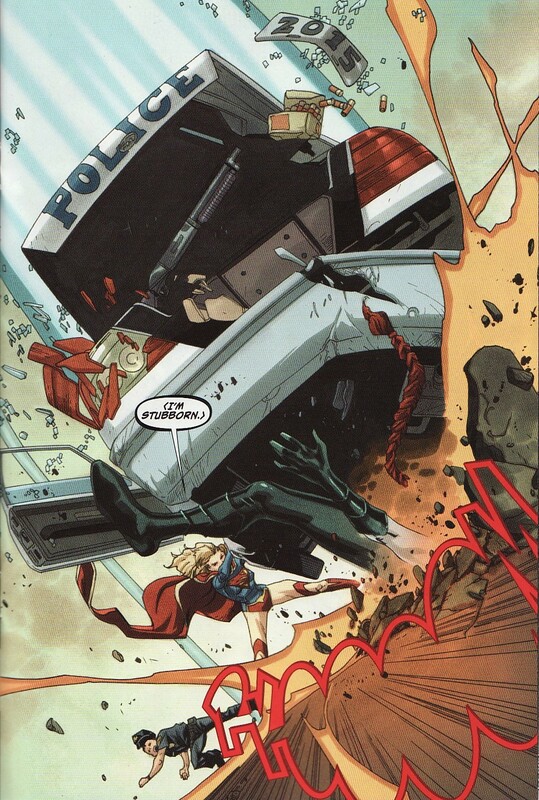 Anytime you can get Supergirl teaming up with Wonder Woman or other heroes, I think it is worth looking at. They were somewhat difficult to find. After looking for them for years, I found these issues in the $2 box at a convention. So if you see them and want them, I'd buy it. I also think it is great to see Supergirl rendered by the greats of the industry, so a Gene Colan Kara is also a rare find. But the overall story and the personality of Supergirl aren't great. 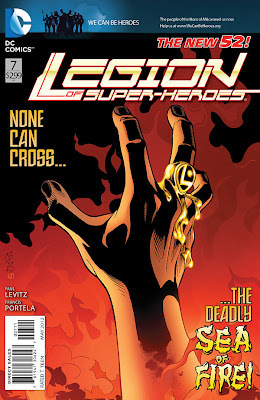 Legion of Super-Heroes #7 continued the trend of good but not great issues for this title. As a longtime Legion fan I keep waiting ... hoping ... the be blown away by a story arc. I love the characters and love the setting. But it has been a while since I put the book down and said 'wow'. Whether it is the Durlan infiltration arc, or the Blue Flame/LSV arc, or the initial Dominator arc in this renumbered title, nothing has been fantastic. In particular, the Blue Flame/LSV arc was muddy and ended with a sort of whimper. And while the other arcs have been fine, I just want so much more from the Legion. One thing I will say is that long time writer Paul Levitz really does a good job of rotating the cast so we get to see a lot of the Legionnaires frequently' no one feels neglected. 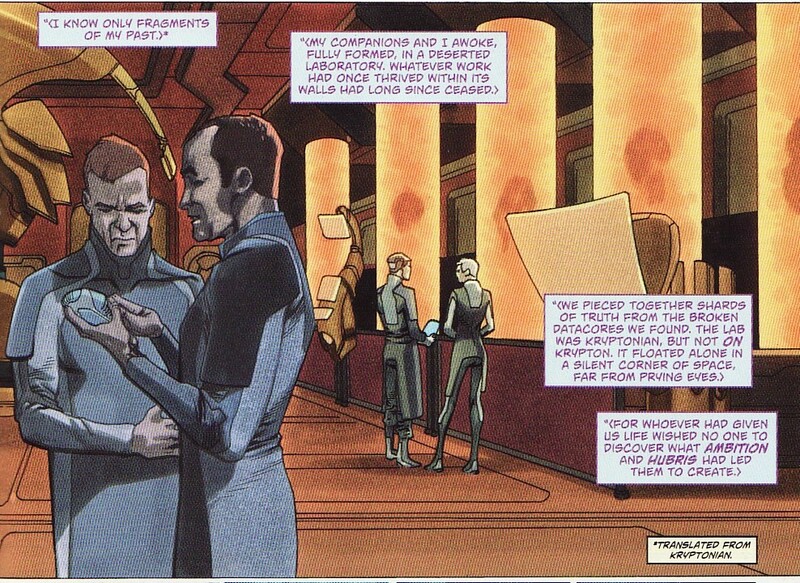 And it looks like the first arc was a sort of prologue to a massive Dominator storyline coming up. Maybe that'll be the 'knock my socks off' arc I need. And I absolutely love Francis Portela's art on the book. Maybe that is part of my problem. Portela's art is so slick, I just want a spectacular story to go along with it. This issue is the second part of a 2 part mission in China where an industrial disaster is linked to an uprising of a cult/gang determined to take over the country. 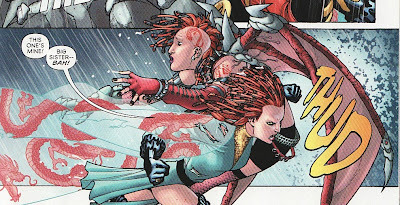 The gang storyline has a nice personal wrinkle to it as Dragonwing's estranged sister is on the gang's roster. It looks as though there is little love lost between the two siblings. I have come to like Dragonwing more and more. She seems the most committed of the new recruits, the one who takes the responsibility the most seriously ... probably born from these troublesome beginnings. Here I like that she uses plain old hand-to-hand combat techniques to fight her foes, praising her Legion training. And stealing fire from the imperial horde? Sounds almost Iron Fist/ Shou-Lao like. I know I praised Levitz' ability to juggle the huge roster of characters earlier this very post. But in this issue, these breakaways tended to distract from the main story on China. Here, Mon-El and Brainy agree to hold a new election for Legion Leader. Will this be a reader poll again? Mon-El never really gelled as leader what with the Green Lantern ring subplot. And we catch up a bit with the Dominator threat which sounds like a doozy! They have perfected the genetic splicing of Daxamite genes into their DNA, giving them all the powers of Daxamites with none of the weaknesses. We saw what an army of Daxamites can do in the Great Darkness Saga. This isn't going to be pretty! I actually am a little bit amped for this. The industrial accident at China's sea of fire continues to rage on despite Element Lad and Chemical Kid's attempts to squelch it. So in comes Sun Boy to drain off the power. 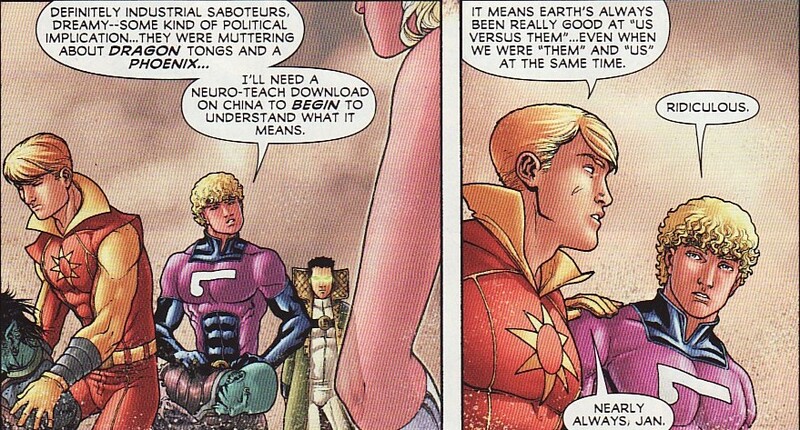 I like the fact that Levitz is writing Dirk as extremely powerful. It makes sense and adds some further credence to his superiority complex. Nice panel here by Portela too. And the disaster was part of the cult uprising, an added bit of chaos. Again, Levitz has such a command of these characters. The simple 'ridiculous' by Element Lad is perfect. He probably can't understand while people of the same lineage would kill each other ... especially since he has no one else from Trom alive. He would cherish life. 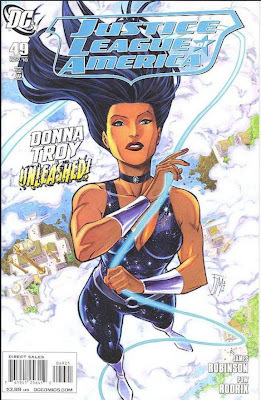 Another thing I liked about this issue was Dream Girl maneuvering the Legion from afar, sending Comet Queen and Harmonia Li to China to pitch in. Levitz always had Dreamy be one of the smartest Legionnaires so seeing her moving the pieces around the chessboard was a welcome site. 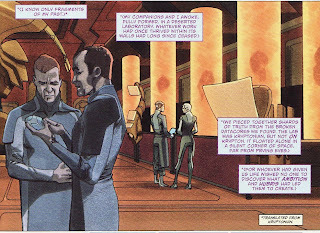 I wonder if he is setting her up to be leader again, especially since she was leader during the Great Darkness Saga ... she would have the experience to deal with those Dax-ominators. And Harmonia Li, now clad in a Shiva-like outfit, shows her elemental powers by eliminating the cult's leader, burying him under rock. 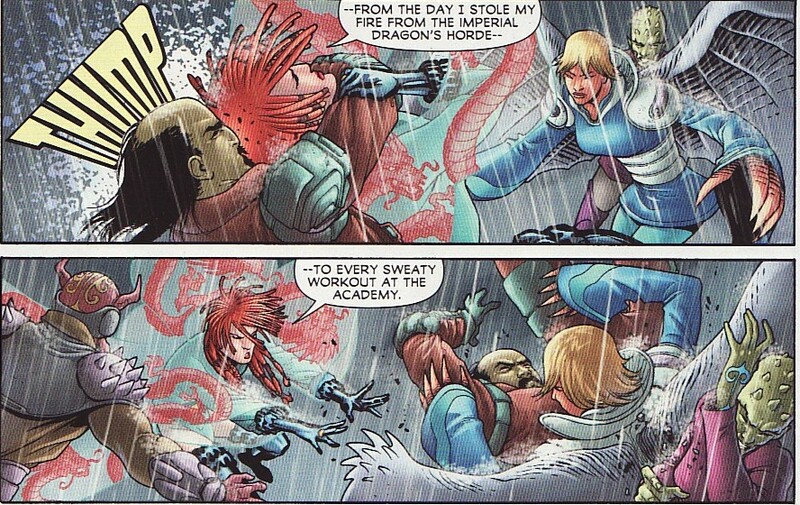 And Dragonwing shows her sister who her real family is. Man, that is some beautiful violence drawn by Portela. One plot that has been kicking around this book for a while is Chemical Kid learning that being a Legionnaire isn't all fun and games. There is risk and danger. He has seen it first hand in his attempts to use his powers to stem the tide. And he has seen veterans like Chameleon Boy come close to death in combat. Kid was portrayed as a spoiled brat who bought his powers in Adventure Comics. I can't imagine he would want to stay a Legionnaire for long. Or maybe he'll develop PTSD. But either way, with what we know of him I wouldn't make sense for him to continue to head to the front. So I hope Levitz shows him struggling with things away from a missions scenario. So again, nothing horrifically wrong here. But nothing earth-shattering either. Maybe the next arc will bring the good stuff we have seen so far and elevate it. In all the DC Comics books this week, there was a 2 pages of preview pages depending on which 'grouping' the book belongs. For Supergirl, we got a column about the upcoming stories in the Superman family books. Now the Supergirl paragraph is brief and sparse on details. 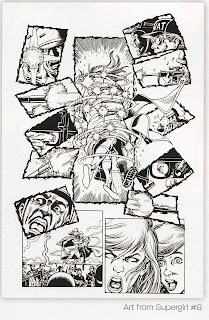 But what we got instead was a preview page from Supergirl #8 drawn by George Perez! 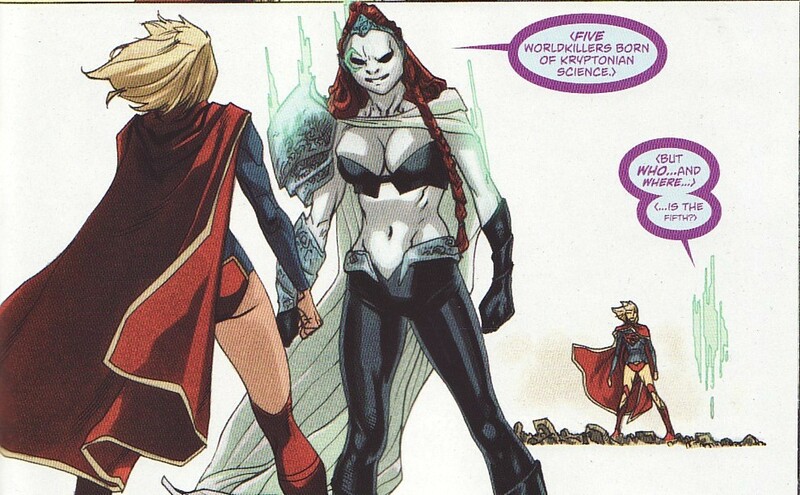 This story introduces the new Silver Banshee and hopefully puts a more Earth-acclimated Supergirl amongst the people. It has been a while since she was able to converse with anyone not attacking her! 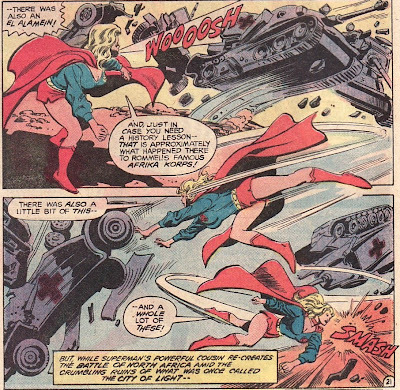 The page is beautiful a montage of panels around the primary action of (apparently) Supergirl being fired upon by the military. (sigh). I am sick of seeing the Super-family fight American troops. Although here they may actually be firing on the Banshee who is being rescued. This is a high res scan so I could see it up close. Can't wait for this issue! 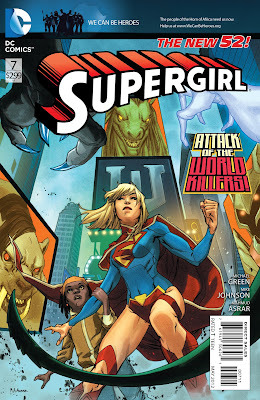 Supergirl #7 came out this week and marked the end of the book's first run, a sort of semi-origin story. I say semi-origin because we don't have all the details yet. Writers Michael Green and Mike Johnson said all along that Kara's origin was going to be a slow boil with more and more details on how she got to Earth being revealed. But this arc accomplished what it needed to. 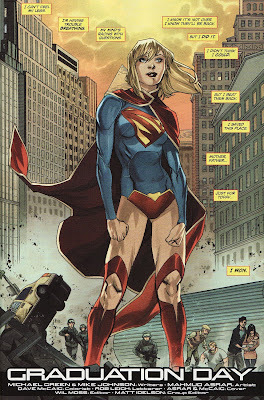 It got Supergirl to Earth and started on the path of heroism. We only know the broadest strokes of her origin. She was sent to Earth via a pod from Argo City which initially survived the explosion of Krypton. But outside of that we only have some threads and some mysteries. I have to say I have puzzled over these details a lot and have some thoughts. But like Kara, I am flying a bit blind. But for me, this issue again cemented the fact that the creative team is going to have Supergirl be the sort hero she ought to be. I know I am beating a dead horse here but the initial publicity pieces and the current Supergirl character page on the DC website play up Kara as being an out of control, disaffected, isolated, angry young woman. If this issue doesn't squelch that completely, I don't know what will. I can't thank the creators enough for that. And, as always, Mahmud Asrar really delivers a completely phenomenal issue full of insane action drawn both big and small. This is a 20 page brawl, no doubt, but with wonderful characterization slid between the punches. The issue starts with Reign giving some exposition about the origin of the Worldkillers. They were embryos from other planets which were stolen by Kryptonian scientists and experimented on. These manipulations were designed to strengthen and embolden these creatures. 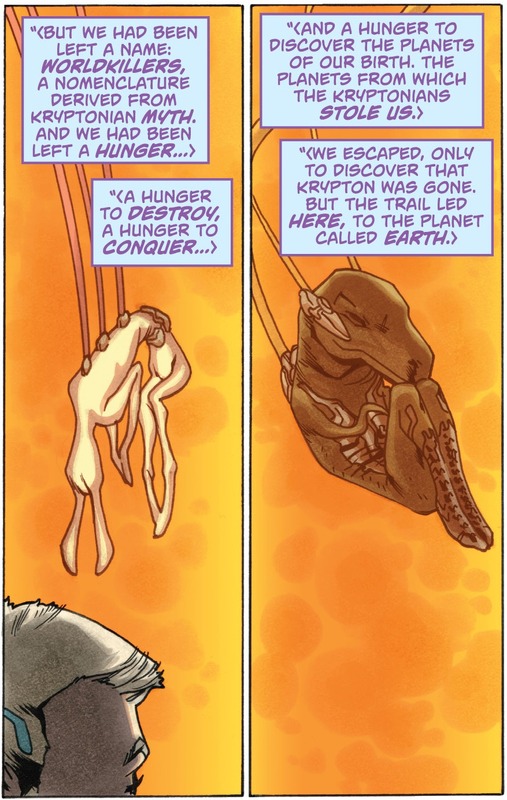 And they were named Worldkillers after Kryptonian mythological creatures. They awaken from their suspended animation on the dying city of Argo, learned what they could there, and have been on the hunt for their own origins since then. It is close enought to Kara's story to make me pause. But more on that later. 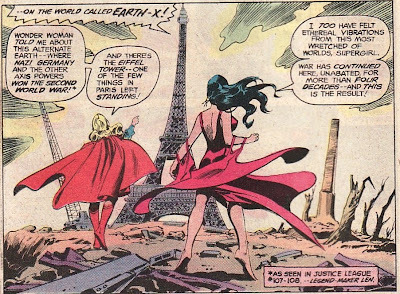 Now one thing that remains fuzzy about a lot of Supergirl's origins is the timeline of key events. 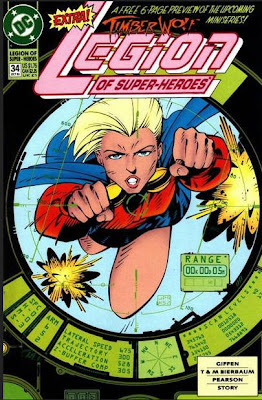 For example, when was Supergirl rocketed? From Argo before or after the destruction of Krypton? Here, I wonder when did these experiments begin? On the whole Krypton? Or initiated when Argo was shaken free? My gut tells me this began before Krypton exploded. And these sort of experiments jibe with prior versions of Krypton where genetic manipulation was widespread. But this story is in the background of the battle happening on in the city. Supergirl is fighting the four Worldkillers and barely holding her own. The four Killers seem like a sort of slanted Four Horsemen of the Apocalypse. Reign is the tactical leader, like Death who led the horsemen. Deimax deals in mass terrain destruction like War. Perrilus deals in virus generation and population extinction like plague. And Flower of Heaven is a blaster who specializes in planetary systems overload? Like famine? Stripping the land of its fertility? Okay, it isn't neat and clean. But that was my first thought. We also get another look at Supergirl's unique power. It seems female Kryptonians can do some sort of solar flare power. Great panel here. 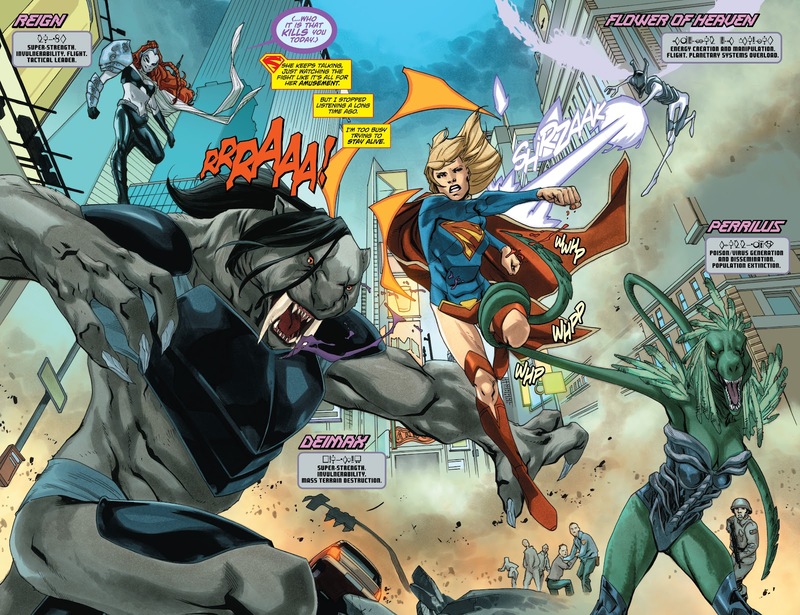 The fight spills through the city and Supergirl realizes she needs to take the fight into the air because there are 'too many innocents' around. Supergirl already cares about the people of Earth. The city is encased in a force field which makes Supergirl wonder how the Worldkillers got hold of Zor-El's technology. Now sure, they are in a ship probably from Krypton which may be equipped with the ability. But that seems too easy. What if the Worldkillers were responsible somehow for the field which saved Argo? What if they saved the city while being kept in stasis? And is that what Zor-El wanted to tell Kara? The truth behind how he saved Argo. Without a connection to the people of Earth, it is possible Supergirl could have accepted the offer. But instead Supergirl shows she is not a killer, shouting she is stubborn, and leveling Reign. Now being stubborn is something I can deal with in a new hero. And this was just too great a splash not to share. One editing note: when Reign says only Worldkillers can defeat Worldkillers, it is written that only Wordkillers can defeat Wordkillers. Typos like that, especially in a key line in the script, distract. Now there are lots of great panels in this issue. But this one might ... might ... be my favorite. Probably my second favorite. Supergirl says she won't let anyone else be hurt. She'll die before she let's that happen. She has something to save. That is a sort of 'turn the corner' panel in characterization. This Kara is a hero, willing to die to save an alien race she doesn't know at all. And those words just wonderfully complement the art which show that death is a possibility and bloody knuckles are a certainty. The angle is looking up on the fierce Worldkillers, tooth an claw bared. The only thing we see of the protagonist is her clenched fist, a sign of defiance against the odds. Fantastic! But only Worldkillers can defeat Worldkillers. 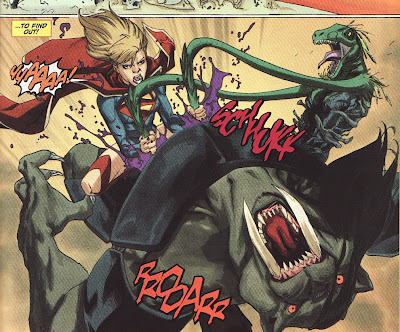 So ingeniously, Kara grabs the poison stingers of Perrilus and impales Deimax. It shows Supergirl is intelligent and battle savvy and gutsy. With one of her troops down and potentially dying, Reign decides to retreat. And there was a 5th tube in that deserted lab on Argo. 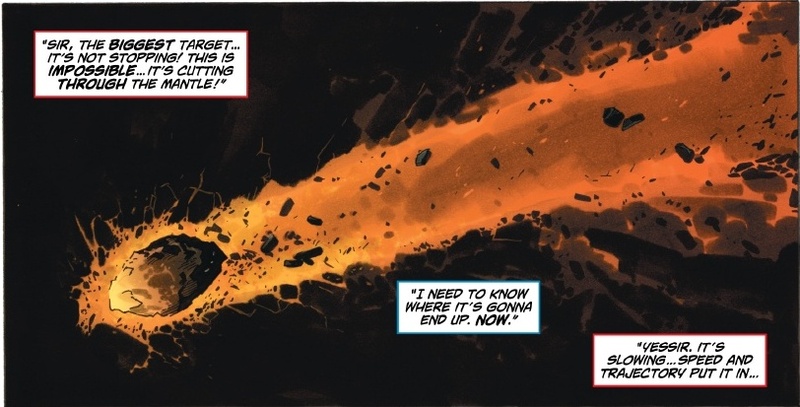 Who is the fifth Worldkiller? Well, all these 'hmmms' make me wonder if it's Supergirl. She could stand toe to toe with Worldkillers, something only Worldkillers can do. She can do unique things - like a solar flare - that other powered Kryptonians can't, as if she was genetically enhanced or evolved. She has no recollection of the destruction of Krypton or the plight of Argo City ... maybe because she was in stasis in a tube. 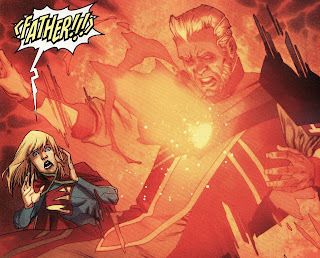 And maybe that is what Zor-El wanted to tell her ... the truth about her ... that she was experimented on. As an old time fan, I don't want Kara to have been experimented on by her father, to be a 'Worldkiller'. But we'll see how this plays out. This is my favorite panel, an ending splash page and great capstone for this arc. The Worldkillers are gone, the dome has been lifted, and a tired Supergirl sports a sort of satisfied and incredulous look on her face. She says for once she won. Maybe she underestimates herself and needs to become confident along the hero's journey. And what a great natural pose by Asrar here. You can feel her fatigue and happiness. And no needless cheesecake. The title 'Graduation Day' makes me think that Kara will view this battle as the 'trial' she was supposed to go through on Krypton, that she feels she has earned her uniform now. So we have learned more about Argo and Krypton. We have a lot of puzzle pieces that need to merge into a coherent history. And we have a Supergirl risking her life to aid others. Not one 'Hell on Wheels', disaffected panel here! And that makes me a happy fan. Super BFF Short ... AWESOME!